Image Title: "Mt. Adams, Lonely Cow"
Mt. 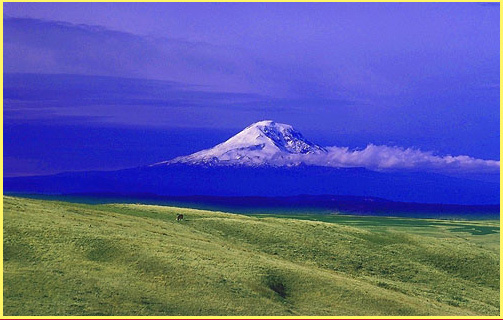 Adams is the Northwest's second tallest peak at 12,276 feet, and is widely visible from many parts of Northern Oregon, both east and west of the Cascades. In the old days, 1929-1937, sulphur mining was done on the summit. The operation was finally shut down in 1959. There was a trail up the relatively gentle south side that pack animals used to haul supplies, at the rate of about 168 mule packs trains per summer during the height of the mining before World War II.... A Forest Service lookout cabin also existed for many years on the summit but was only manned for a short time, 1921-1924-- to my knowledge, it was the very highest lookout in all of America at the time..... A visitor in 1943 reported that at that time it was "a beautiful cabin and probably saved a few lives." 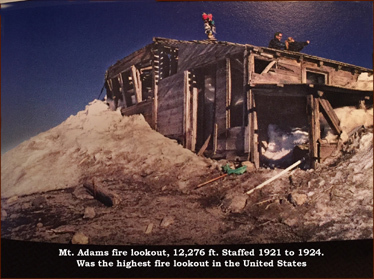 In recent years, the cabin is still in fairly good condition, but is usually so buried in snow that many who visit the summit do not even see or recognize it. 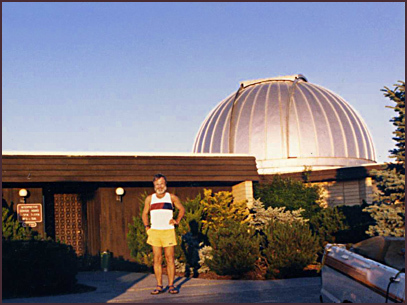 It's a wooden structure somewhat larger than the average cupola-type lookout of the era (click to see an example). This was because the mining operation twice built onto the lookout to create room for its men. If you go onto Google Earth and zoom in on the summit plateau, off on the extreme left side of that summit area is a small picture icon all by itself. It's labelled something about "panorama"-- click on that, and double click to enlarge it fully. It is a magnificent, high-resolution panorama that includes the old lookout cabin, almost fully melted-out. E-mailer: brucej@oregonphotos.com -- click for a direct link to communicate with me about ordering a premium Chromira print of "Mt. Adams, Lonely Cow." Size is 8x12, price is $26, plus shipping.